Rebecca is a ceramicist with a BA in Fine & Applied Arts. She spent time at Belleek Pottery before furthering her skills at the International Ceramic Research Centre in Denmark. 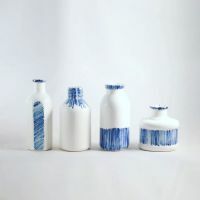 Her fine bone glazed china bottles and dishes are handmade using the slip method and decorated in delicate contrasting patterns of cobalt blue. Rebecca recently featured in ‘Décor’ magazine and was highly recognized for her work when she received a UK ‘Etsy Award’.